Extra large shelter - ideal for working, or large groups! Looking for a large group shelter with multiple set-up options? Then the DD Tarp 5 x 5 is the answer! With sufficient shelter to cover a whole outdoor community, this tarp has been designed to provide a dry cover solution for Scouts, outdoor / bushcraft teaching and activity groups, team events or for an outdoor work space. A massive 25 reinforced attachment points including 9 central attachment points allow for a multitude of set-up options, and will ensure that you are not stuck for tie-outs – very handy for a tarp of this size! With the same fully waterproof PU 3000mm coating as the rest of the DD tarp range, it will provide invaluable protection from all the elements! 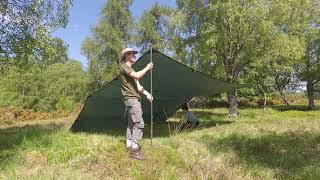 Please note that this tarp is not recommended for solo use/shelters – it is simply too big! 25 tough reinforced attachment points: 16 around the sides and corners, 9 along the centre.